Do you use specific breeds of dogs for bio-detection? All dogs and breeds have the capability to detect cancer, other diseases and crisis situations in humans. However because our dogs screen samples on a carousel we select working breeds with a high hunt drive. Our dogs are a mixture of breeds including Labradors and working spaniels and are chosen according to their ability. It is important that they have good noses and love searching and hunting for toys. How long does it take to train a bio-detection dog? The length of time to train a bio-detection dog varies depending on a number of things, such as the odour they are being trained to detect, the sample type they are using, and the dog itself (all dogs learn at different speeds, the same as humans). It generally takes 6-8 months for a dog to reach a good level of performance. How often do the Bio-detection Dogs work? They come into work at our centre in Great Horwood up to 4 days a week, and work for short periods of up to about 20 minutes at a time. There are lots of opportunities for rest and playtime. The dogs view their work as a great game that they love playing. Where do they live? The charity has a no-kennel policy. All our bio-detection dogs live in homes as part of a caring family with our fantastic volunteer fosterers, and lead normal, happy lives as pet dogs. They are dropped off in the morning and picked up in the evening. Do you offer a screening service? We do not currently offer a cancer screening service. Although other published studies indicate high levels of accuracy, until we have published robust, acceptable accuracy rates for the detection of a particular type of cancer we are unable to offer a screening service to clinicians. This is however one of our goals, and would always be undertaken under the supervision of a medical professional. Can you supply me with a personal bio-detection dog? Our bio-detection dogs work only on site sniffing samples as part of our research studies, and unfortunately we cannot provide dogs to individuals to detect cancer or other such diseases. What are the dogs detecting? With their incredible sense of smell dogs can detect the minute odours now understood to be associated with many cancers and other diseases. Bio Detection Dogs are trained to detect the odour of volatiles associated with the disease present in urine, faecal, skin swabs or breath samples. The dogs work on samples in the bio-detection room at the training centre and are not trained to detect the odour on a person. What type of training do you use? Our fundamental training method is reward based and we use clicker training for all our bio-detection work. Dogs are rewarded with a food treat or tennis ball play when they make an accurate assessment of the samples they are working on. What is your aim? The dogs have the capacity to provide second line diagnostic support for cancers that are currently difficult to diagnose reliably, such as prostate cancer. Our research will also inform and enable the development of electronic systems using the information that the dogs have told us. What other diseases could bio-detection dogs be used to detect? All diseases appear to have a biochemical change which causes a change in odour in our bodies, and has been used by physicians for centuries to inform the diagnosis and treatment of disease. The potential therefore for the bio-detection of all kinds of disease, not just cancer, is huge. We are currently actively researching the detection of Parkinson’s disease, malaria, and bacterial infections. The possibilities for other disease areas are endless, and limited primarily by funding. How long is the waiting list for a Medical Alert Assistance Dog? Once the completed application is received the waiting list is 18 months, depending on individual requirements and the severity of the medical condition. How many Medical Alert Assistance Dogs do you have? We have placed over 80 throughout the country. Which conditions do you train Medical Alert Assistance Dogs for? We currently train dogs to assist people living with Type 1 diabetes, Addison’s, severe nut allergy, and PoTS. We will also consider individuals with other life threatening conditions. What costs are covered by the charity? We do not make any charge for our dogs and during the training period we pay for the dog’s insurance, veterinary fees, medical supplies, equipment, toys, training and food. Once the dog is placed, the client takes over financial support. Does the charity cover the whole of the UK? We cover the whole of England, Wales and Scotland, and have applications for dogs from all areas. Can Medical Detection Dogs train family owned dogs? Sometimes people approach us with a pet dog that is showing signs of alerting to their particular condition. If the circumstances are appropriate we will provide support to the client to train their dog and help the dog to become a qualified assistance dog. For further details please follow this link. How are dogs trained? Dogs are trained using scent and breath samples collected from the client when they are experiencing an episode. The dogs are trained to identify the unique odours. At what age are dogs trained? Dogs are usually ready for advanced training and placement with their new owner at around 18 months old, but this depends on the dog and breed as they have to be mature enough to begin the process. How do the dogs alert their owners? Dog alerts need to be clear and persistent, as our clients often have no awareness of an imminent “episode”. The dogs are with their owners 24/7 and alert during both the day and night. Dogs are trained to alert by either jumping up and/or licking strongly. The type of alert will vary depending on the needs of the client. How do you ensure the Medical Alert Assistance Dogs are able to get enough sleep when, as part of their role, they often wake at night to alert their owner? Most dogs will sleep between 12 and 18 hours a day. Active assistance dogs will sleep less than sedentary pets as, it is thought, dogs have a tendency to sleep when nothing stimulating is happening. Dogs also have a much easier time of scheduling their sleep as they are able to simply shift their sleeping time to whatever time is available. Dogs have sleep cycles in which they experience periods of quiet, restful sleep, interspaced with periods of REM (rapid eye movement) sleep. Dogs cycle through the various stages very quickly (15 minutes) compared to humans (90 minutes). This means that they are well suited to interrupted sleep patterns. For example if you are at home in bed and at 3.00 am someone tries to break in to your house you would expect your dog to react. The dog has not been waiting for someone to break in but has reacted to the event. In the same way the Medical Alert Assistance Dogs react when they smell the change in odour associated with their owner’s medical condition. 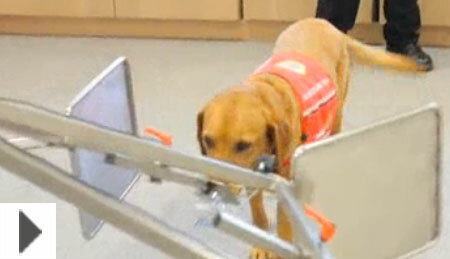 How accurate are Medical Alert Assistance Dogs? 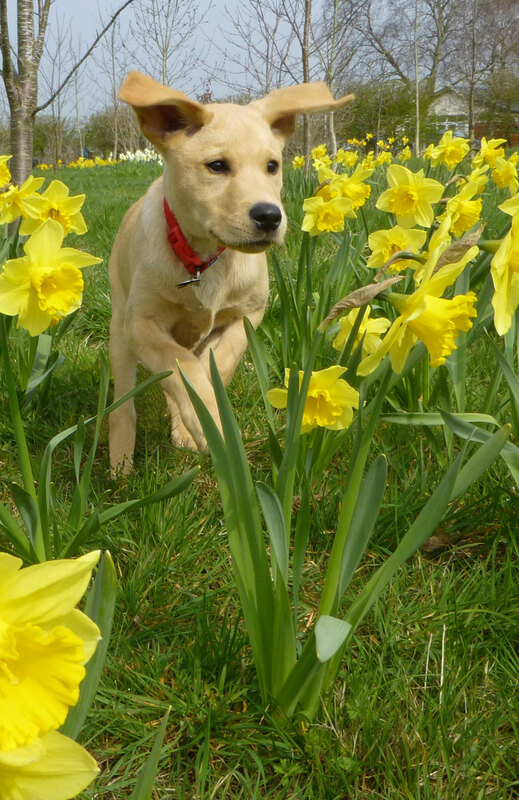 We regularly monitor the performance of all our Medical Alert Assistance Dogs, collating data of the alerting behaviour normally exhibited by the dog and calculating true alerts and false positives. The partnership does not qualify until alerting accuracy reaches 90% or above, with a false positive rate of 10% or less. At Medical Detection Dogs we ensure all our dogs are closely monitored for alerting performance, behaviour and their effect on the individual’s health and wellbeing. Our stringent criteria mean every client regularly tests their blood and the dog becomes an additional aid alongside continuous careful management of their condition. Which associations do Medical Detection Dogs belong to? Medical Detection Dogs is a member of Assistance Dogs International (ADI), Assistance Dogs Europe (ADEu) and Assistance Dogs UK (ADUK), and all our Medical Alert Assistance dogs are fully accredited assistance dogs. Are there any other organisations that provide Medical Alert Assistance Dogs in the UK? Medical Detection Dogs is the only organisation in the UK that is a full member of Assistance Dogs International, and the only organisation which trains fully accredited diabetes alert assistance dogs. What is Medical Detection Dogs’ view on non-accredited diabetic assistance dogs? Medical Detection Dogs is very concerned about untrained non-accredited dogs being supplied to alert to low and high blood sugars for people with Type 1 diabetes. It has been brought to our attention that at least one organisation has been training and selling these dogs for profit but not providing an aftercare monitoring or follow-up service. How do you know a dog is accredited? All Medical Detection Dogs’ coats carry the ADUK logo and all clients carry the ADUK passport or an official “in training” letter prior to qualification. Non-accredited dogs can be identified by the absence of this logo. Where do you get the dogs from? Dogs can be donated by members of the public, breeders, other assistance dog charities and rescue centres. The temperament of the dog is very important (Medical Alert Assistance Dogs should be very “people orientated”), as is a good sense of smell. Does the charity receive any funding? The charity is wholly reliant on donations and receives no government funding. How much does it cost to train a dog? 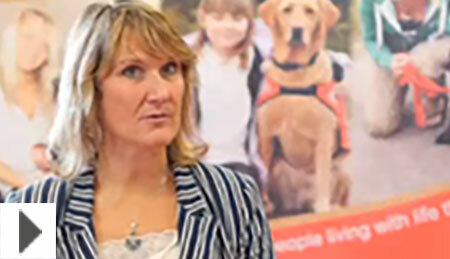 The total cost of training and placing a Medical Alert Assistance Dog is £29,000. The total cost of training a Bio Detection Dog is £11,500 with an ongoing monthly cost of £600. Can I donate a sample for you to use in your research? Unfortunately, in general, we are not permitted to accept samples for our research studies outside of the agreed NHS clinics and academic units we are collaborating with. All our NHS studies are governed by strict ethical and management regulations. At certain times however we may in a position to accept samples for use outside of our clinical trials, for internal training and demonstrations. Do you take on placement students? Due to rapid expansion and workload Medical Detection Dogs is only able to offer a limited number of opportunities for students, and prefer longer term ‘intern’ positions. We take the welfare of our Medical Detection Dogs extremely seriously. From the moment they come to us as puppies we ensure the highest standards of care for our dogs. We have a strict no kennel policy and all our dogs live in the homes of our staff or fantastic local volunteers where they are loved and cared for as part of the family. FREEDOM FROM DISCOMFORT (temperature, hard bedding, etc.). How do you ensure the Medical Detection Dogs are able to get enough sleep when, as part of their role, they often wake at night to alert their owner? Most dogs will sleep between 12 and 18 hours a day. Active service dogs will sleep less than sedentary pets as, it is thought, dogs have a tendency to sleep when nothing stimulating is happening. Dogs also have a much easier time of scheduling their sleep as they are able to simply shift their sleeping time to whatever time is available. Dogs have sleep cycles in which they experience periods of quiet, restful sleep, interspaced with periods of REM (rapid eye movement) sleep. Dogs cycle through the various stages very quickly (15 minutes) compared to humans (90 minutes). This means that they are well suited to interrupted sleep patterns. How are dogs able to wake up to alert their owner? The smell of food will quickly awaken a dog during any sleep cycles and our dogs are also woken by the particular odour which they have been trained to link to a food reward. In other words they can carry out their detection work even while asleep. How can we help a Medical Detection Dog, or indeed any dog, with their sleep requirements? If you see your dog in REM sleep, i.e. eyelids twitching, barking or ‘running,’ then research has shown that their movements relate to the part of the brain that is active when a dog is chasing prey. It is not a bad dream. Sleeping on their back is usually done during deep (REM) sleep. It may also be done if the dog is trying to cool itself. They are comfortable in this position. Curled up dogs may not sleep deeply as they cannot completely relax their muscles. It may also be indicative of the dog being too cold. Make sure they always have space to stretch out and are not in a draught. Let them sleep, let them dream and get their rest. What are the main dog welfare issues in Britain at present? Research from the Royal Veterinary College has highlighted the most urgent issues that need to be addressed for the improvement of dog welfare in Britain. These include owners’ lack of awareness of welfare needs, inherited disease or exaggerated physical features, intensive and unregulated puppy rearing, a lack of appropriate provision for behavioural needs and poor health due to the animal being overweight. What is obesity and why is it an issue in dogs? Far from being comical, obesity in our dogs is a welfare issue and rightly so. All dogs, pets or otherwise, deserve the best care possible and our Medical Detection Dogs absolutely require good care. We depend on them for the services they provide and they depend on us to keep them free from pain and discomfort. Obesity can be defined as an excess of body fat that is enough to impair health, welfare and quality of life. Fat excess in dogs is attributed to several factors, including genetic pre-disposition, reproductive management and dietary/exercise (human) management. There are also some diseases that can cause excessive weight. Too much weight is a serious welfare issue in pets because it can cause unnecessary suffering and can be extremely disabling to dogs. It can also affect the dog for long periods or, in some cases, cause health problems for their whole life. What problems can arise if a dog is obese? Problems which have a direct link to obesity can include orthopaedic disease (arthritis/joint pain), diabetes mellitus, abnormalities in circulating lipid profiles, cardio respiratory disease, urinary disorders, reproductive disorders, neoplasia (mammary tumours and transitional cell carcinoma), dermatological diseases, and anaesthetic complications. (German 2006). What effect can these obesity-related issues have on a dog? These conditions not only shorten the expected lifespan of the affected animals, but also reduce their health-related quality of life, so weight problems in dogs have considerable potential to cause suffering. One questionnaire-based study (German and others 2012b) tried to assess the health-related quality of life of dogs following weight loss. A clear correlation was found between a reduction in weight and fat mass and an increase in vitality. It was also found that dogs showed fewer signs of being emotionally disturbed and of being in pain following a successful weight loss programme. I don’t think my dog is overweight, but how can I check? A number of approaches have been developed to help owners and vets address the issue of pets being overweight and obese, both through collaboration with pet food companies and through development of practice-friendly guidelines from central veterinary organisations (Freeman and others 2011, Brooks and others 2014). Tools such as the body condition score (BCS) have been developed to enable owners to check whether their companion is a healthy size. There are a few simple checks you can do yourself. If you are still unsure of the appropriate body profile of your dog, see your veterinarian for a professional opinion. What can I do to help to keep my dog’s weight steady, or perhaps to help it lose weight? Add a little extra active play to his day. Take a portion of his daily diet and use it for treats rather than adding to the daily meal with extra treats. If the weight is not coming off, take your dog for a check-up by your veterinarian and, perhaps, special food advice. Dr. Joan C. Hendricks, DVM; University of Pennsylvania; School of Veterinary Medicine. William Dement, MD; University of Stanford. Stanley Coren, MD; University of British Columbia. Dr. Alan Beck; Director of the Centre of Applied Ethology and Animal-Human Interaction; Purdue University School of Veterinary Medicine. Buckland EL, Whiting MC, Abeyesinghe SM, Asher L, Corr S, and Wathes CM 2013 A survey of stakeholders’ opinions on the priority issues affecting the welfare of companion dogs in Great Britain. Animal Welfare 22: 239-253. 88. Dorsten CM, Cooper DM. Use of body condition scoring to manage body weight in dogs. Contemp Top Lab Anim Sci 2004;43:34-37. 89. Laflamme DP. Development and validation of a body condition score system for dogs: a clinical tool. Canine Pract 1997;22:10-15.